Mate Precision Tooling, Anoka, MN, will introduce its Rapidset adjustable thick turret canisters for use with Mate Original Style and AMX punch-press tooling. 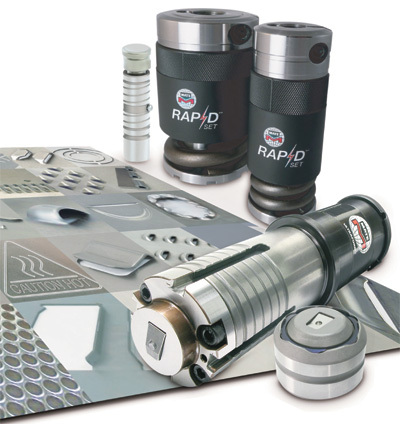 Rapidset—also compatible with Amada Standard, Amada ABS and Wilson Standard tooling styles—provides quick tool changes and makes punch-length adjustment faster with existing tooling inventories. Features: non-rotating clamping head with easily adjustable clamping screw for setting punch length; textured Gription canister for ease of handling; and a preloaded self-contained spring pack that provides consistent stripping pressure, die penetration and reduced slug-pulling. Available in A and B station canisters. Also on display: The new XMT12.7A adjustable-length punch for Euromac XMTE10 Multi-Tools. The design allows punch-length adjustment by rotating the punch head. When coupled with XMT12.7A’s standard high-speed steel punches, grind life can be tripled.